Even as the fighting in Gaza continued to generate major coverage last week, the media focus shifted back to Washington and the daunting tasks confronting incoming president Barack Obama. Thanks to his increasingly aggressive campaign for a stimulus package and some controversial appointments, Obama’s transition was the top story from Jan. 5-11, according to the News Coverage Index from the Pew Research Center’s Project for Excellence in Journalism. At 26% of the newshole, the subject more than tripled its coverage from the previous week. While Obama’s advocacy for an economic package stood in contrast to his relative silence on the Mideast, the Gaza conflict was the second-biggest story last week (17%), dropping modestly from the previous week when it was No. 1. The war narrative seemed to evolve last week, with an increasing focus on the humanitarian situation inside Gaza. The third-biggest story, at 12%, was the scandal that keeps on making news. As Illinois Governor Rod Blagojevich was being impeached last week, the man he picked to replace Obama went to the Capitol and appeared to make some headway in his battle to be seated as Senator. That saga was followed closely by the No. 4 story, the continuing economic crisis, at 10% of the newshole. Last week also marked the continuation of a trend in evidence since the voters cast their ballots on Nov. 4. In every week since the election, the news agenda has been more diverse and diffuse, with three, and sometimes four stories each accounting for at least 10% of the newshole. By way of comparison, there were no more than two stories in double digits in any week between Aug. 18 and Election Day—a period when intense campaign coverage was dominating the news agenda. What a difference a week makes. In the first week of 2009, the new Obama administration was only the fourth-biggest story, it filled just 8% of the newshole, and the biggest storyline was the President-elect’s response to the fighting in Gaza. Last week, the transition was easily the No. 1 story and the two dominant components were Obama’s plans for the economy and his appointments to high office—which combined for more than three-quarters of transition coverage. On the appointments side, Obama had to contend with Bill Richardson’s withdrawal as a candidate for Commerce Secretary, some resistance to his nomination of former Clinton chief of staff Leon Panetta as CIA director, and opposition to the prospect of tapping telegenic CNN medical correspondent Dr. Sanjay Gupta as Surgeon General. While House Judiciary Chairman John Conyers objected to Gupta’s lack of “requisite experience,” New York Times columnist Paul Krugman blasted Gupta for what he described as an unfair “mugging” of filmmaker Michael Moore over his health care documentary Sicko. One message embedded in last week’s transition coverage was that Obama may not be able to count on any extended honeymoon after Jan. 20. More significant news was made by Israel’s decision to allow humanitarian aid into Gaza, the passage of a UN cease fire resolution, and truce talks brokered by Egypt. But as the fighting raged on, a good deal of the storyline was about the civilian casualties, with the UN growing more vocal on the issue and ratcheting up pressure on Israel. The scandal surrounding the Illinois Governor accused of trying to sell Obama’s Senate seat has been a consistent newsmaker since he was arrested the morning of Dec. 9. And for most of last week, coverage focused on Roland Burris’ trip to Washington to attempt to take his seat in the Senate. He was not sworn in, but still seemed to be doing pretty well in a high stakes public relations battle fought in both the media and Congress. On the March 9 edition of MSNBC’s Hardball, host Chris Matthews bestowed a special “moxie” award on Burris, professing admiration for the former Illinois Attorney General’s determined effort to overcome deep Democratic opposition to his seating. The drama shifted back to Illinois on Jan. 9 when an unbowed and Tennyson-spouting Blagojevich made his case to the public after being impeached. “The governor responded with what has become trademark defiance since he arrested on federal charges a month ago,” said an Associated Press story posted on MSNBC.com. “He accused the House of retaliating against him for trying to help the people of Illinois and said he’s confident he’ll be ‘properly exonerated’ at a Senate trial.” At least for now, there is no sign of either Blagojevich or Burris giving up without a major fight. The No. 4 story, the economic crisis, was down a bit from the previous week (to 10% from 13%), although much of the coverage of the Presidential transition last week was also about Obama’s plans for mitigating the meltdown. The top storylines included coverage of the crisis’ impact on average Americans as well as the increasingly grim job situation in a week in which we learned that unemployment topped the 7% mark in December. Somewhat typical of the coverage was a Jan. 8 Wall Street Journal story that talked about a 35-year-old woman upset over the fact that her 401 K had lost 44% of its value in a year. 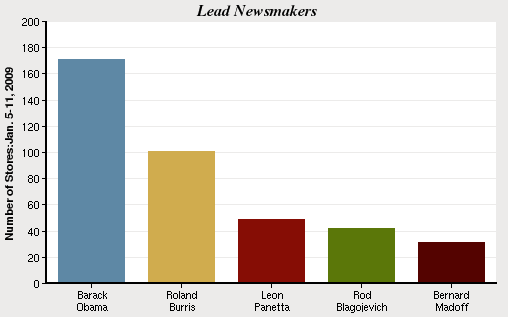 President-elect Obama was the lead newsmaker last week, followed by two men at the center of the Illinois political scandal, Roland Burris (No. 2) and Rod Blagojevich (No. 4) Obama’s surprise pick for CIA director, Leon Panetta, was No. 3 on the list of newsmakers. Bernard Madoff, who stands accused of a massive investor hoax, was the fifth-leading headline maker of the week. In a week in which Congress held hearings on the Madoff scandal, that unfolding saga was the No. 5 story from Jan. 5-11, filling 3% of the newshole according to the News Coverage Index. The new U.S. Congress—which was sworn in last week without Burris and a winner in the still contested Minnesota Senate race—was the sixth-biggest story, at 2%. Next came bad weather, most notably major flooding in the Pacific Northwest, also at 2%. The No. 8 story (2%) was the troubled U.S. auto industry, and last week, the bad news was that U.S. sales in December 2008 were down dramatically compared with the previous year, from more than 50% at Chrysler to about 30% at GM. Next on the roster (2%) came coverage of Russia, where the major story involved that nation’s decision to cut off natural gas shipments to Europe. Coverage of George Bush’s last few days in the White House was the No. 10 story, at 1%. Each year, PEJ examines the methodology of the Weekly News Index to ensure that both the content studied and the weights applied to each media sector reflect developments in how Americans consume news information. For 2009, PEJ made two adjustments, which went into effect on January 1, 2009. First, we updated the weighting system used to combine the calculations between the different media sectors. In recent surveys conducted by the Pew Research Center for the People & the Press the number of people who say they get their news online has increased. Consequently the weight given to online news stories has increased. Second, we increased from 5 to 12 the number of different Web sites included in our weekly coding. For detailed information on our weighting system or list of outlets, see our methodology page.